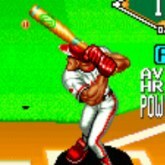 Description: Baseball Stars 2 is a really fun NeoGeo arcade game, with over exaggerated baseball action. This game features 18 teams to choose from around the world and 2 different leagues to play. Classic pixel graphics with funny characters. I love all the bubble gum chewing and the bigger guys tend to be the ones you don't want hitting the ball, because they are likely to hit a home run. The sounds and music is also very entertaining. This one take a little while to get used to, But it's really fun once you get the hang of the controls.